37 CHEREAU, J. D�barquement des Troupes Angloises � Nouvelle Yorck. Paris, ca. 1776. Col. d'�poque. Papier jauni, fortes rousseurs, taches brunes dans les marges. - Paper age-toned and foxing, 2 brown stains in the margins. 260 x 385 mm. � Shows English troops landing in New York City during the Revolution prior to the conquest of the city. With reversed title in French along top margin, captioned again in French at the bottom. 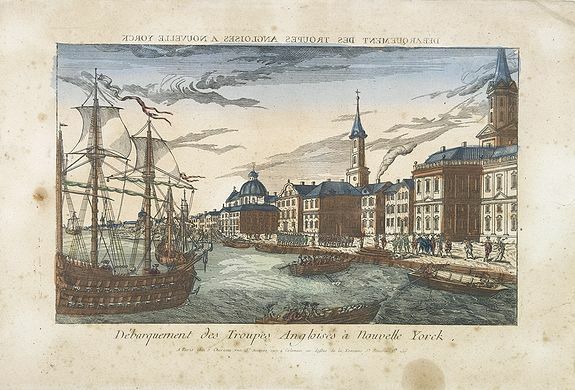 The image shows warships by the docks, soldiers landing, and a Revolutionary War, Colonial period view of part of the City. Although meant to depict an important historical event from the American Revolutionary War, the view of New York is quite fantastical. Nevertheless, this is a rare and wonderfully significant image of British troops invading New York. In the eighteenth and nineteenth centuries there were many popular speciality establishments in Paris, Augsburg and London which produced optical viewing devices and special engravings to be viewed through them. In the 18th century the "optical print" or "vue optique" came into existence, whose exaggerated converging lines were intended to produce the optical illusion of deep recession. The viewing devices for which these perspective prints were produced consisted of a lens and a mirror, this requiring the use of reversed or mirror-image pictures.